From the nutrition scientists who invented the glycemic index—a “speedometer that measures how fast and high your blood glucose level” will spike after a meal heavy in starches and sugar—comes the very first compendium of the sweet substances we typically eat and what happens once they’re in our body. The authors’ academic experience as diabetes specialists couldn’t be more timely given the worldwide explosion of Type II diabetes and its associated epidemic of obesity. The glycemic index (GI) is a number between 1 and 100 that reflects how heavy starches such as bread, rice, pasta, potatoes, and sugary drinks affect our metabolism compared to grains, legumes, fruits, vegetables, milk, and lean proteins. Our love affair with sweetness dates back 50 million years. Human breast milk, our first food, is the sweetest of all mammalian milks. For thousands of years our developing, energy-hungry brains fed on a variety of natural sugars from fruits, berries, saps, honey ants, honeycombs, and nectars. Modern foodstuff puts us in a quandary given that we never evolved to cope with the current environment of plenty. The authors show how cutting out refined white sugar only leads to replacing one source of sweetness for another, and how “sugar-free” foods substitute one kind of calories with something else. The appetite centers in the brain are hard to circumvent. Cut out sugar and you will almost certainly eat more calories from fat, particularly the unhealthy saturated kind. “Diabetic friendly” products are mostly hype because they are still full of other carbohydrates that spike blood sugar. Do calorie-free non-nutritive sweeteners such as Splenda, Equal, and Sweet ’n Low affect the bacteria in our guts (the microbiome) and thus predispose us to weight gain? Do diet drinks and calorie-free sweeteners interfere with the way the brain regulates hunger and feelings of fullness? Why are some vegetables sweet whereas others are not? These are some of the deep questions this book addresses. If you have ever stood in the supermarket aisle wondering what the difference was between dark Karo syrup, light Karo syrup, Golden syrup, real Vermont maple syrup, and the synthetic stuff like Log Cabin and Aunt Jemima, then this book will tell you. It will also surprise you. Maple syrup, research shows, is not particularly high in its glycemic index compared to other high-intensity sweeteners. The key difference among nutritive sweeteners is the effect they have on one’s blood sugar. Glucose-rich sweeteners such as corn syrup (GI 90) and maltose-rich ones derived from grains such as rice and barley (GI 98) send one’s blood sugar through the roof whereas sucrose-rich sweeteners such as brown sugar (GI 65) and fructose-rich sweeteners such as agave syrup (GI 19) burn lower and slower. The book is full of “buzz note” sidebars, reference tables, facts-at-a-glance, and answers to frequently asked questions. How do different foodstuffs affect blood glucose, weight, and behavior? How much carbohydrate should one eat per day? How do plants make sugar, and what are sugar alcohols and net carbs? 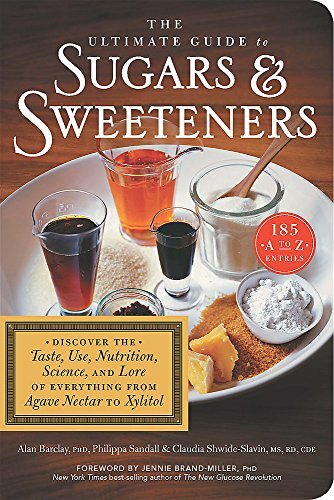 The discussion about corn sweeteners and high fructose corn syrup alone is worth the price of the book. Surprising facts include the prominent use of sugar in cosmetics and moisturizers. You’ll learn about different sugars used for making jams, beers, ales, and malts, what sweeteners work best in baking, and why for millennia we have used sugar as a preservative. As to whether sugar makes children hyperactive, the authors find neither evidence nor a plausible mechanism for how it could do so. Rather, most foods that contain refined sugar also harbor high levels of chemical additives such as colorings and preservatives that have been shown to have adverse effects on a small proportion of children who are hyperactive.